By now you know Trent Richardson was traded from the Cleveland Browns to the Indianapolis Colts. It’s hard to spin this any other way than the Browns giving up on Richardson, but a couple of guys are trying. Ultimately, it’s a good thing that the Browns give up on you. And that you get traded to play with Andrew Luck. Something tells me that with Luck’s ability to throw the ball, Richardson’s job may have gotten a lot easier. Browns rookie Trent Richardson said on NFL Network’s Total Access that he won’t avoid contact and will continue to run through tackles, and he thinks he can do that as a workhorse back for a 16-game season. Richardson said staying healthy in the NFL will be more about what he does off the field than avoiding contact on the field. This is a silly conversation. Asking Richardson to change his running style would be like asking a leopard to change it’s spots. The Browns can use Smelley in several ways. He is competing with second-year fullback Owen Marecic at that position and Alex Smith, Cameron Jordan and Benjamin Watson for a spot at tight end. The one tight end likely safe on the roster is Evan Moore. Coaches often talk about a culture of winning in the locker room. Smelley and Richardson carry that into the Browns’ locker room after beating Texas for the BCS national championship in 2010 and LSU in January. Unless the folks that are supposed to know better don’t know better, Alabama’s Trent Richardson will not win the 2011 Heisman Trophy. Robert Griffin III of Baylor is now predicted to win in a landslide. On the surface, I don’t necessarily have a problem with that. There are a lot of good players up for the award and there are a lot of reasons to argue for most of those candidates. Griffin is certainly Heisman-worthy. I’m sure Tyrann Matthieu’s late surge has had a negative effect on how Richardson will fare. Would Matthieu’s vote total be enough to cost Richardson the trophy outright? Most likely not, but his performance in the SEC championship game as well as being another southern region candidate certainly affected Richardson’s momentum in the race and probably caused a split in their “home region” vote. As I’ve said before, though Matthieu is a great player, he should not have been on the ballot because of his mid-season suspension related to a failed drug test. I’m also certain that there was some amount of backlash against Richardson related to Alabama winding up second in the BCS rankings that came out last Sunday. I know, I know, sports writers are among the most fair-minded and reasonable people there are, but I’m certain some wayward souls used the anti-Bama rhetoric as a basis for downgrading Richardson. Finally, the criteria for voting on this award is very broad, so I don’t usually get lit up about how people vote. Bryan Fisher’s vote, however, did catch my attention. Fisher is based in Los Angeles (I think) and works for CBSSports.com. Here’s how he voted: 1) Robert Griffin III (Baylor); 2) Andrew Luck (Stanford); and 3) Kellen Moore (Boise State). Although only three votes count, he did list the other candidates in the order he would have voted for them: 4) Montee Ball (Wisconsin); 5) Matt Barkley (Southern California); 6) Trent Richardson; and 7) Tyrann Matthieu (LSU). If you’re a voter you can obviously vote for whom you would like. On the other hand, though, Fisher’s comments as to why he put the candidates in this order make me scratch my head. Many expected the close loss to Kansas State to end any hopes of him making it to New York but in the deepest league in the country (sorry SEC fans), Griffin won nine games despite the Bears defense being ranked in the 100’s in most major defensive categories. Safe to say that without RGIII, the Bears would have been 3-9. He’s a great player, but I can tell you how he made it to New York: The Bears only played two top 50 defenses this year with numbers 111, 98, 107, 120 and 115 sprinkled in for good measure. The Cardinal are 23-2 over the past two seasons and that is almost entirely due to Luck. Unfortunately his worst game of the year came when he needed it most, against Oregon…and was more balanced than any other in the country as coaches had no issues sticking to running the ball if it was working. A lot of people turn the Heisman race into a stats race. Luck’s were good (3,170 yards passing, 35 touchdowns, 9 interceptions) but didn’t top others. The thing I always kept in mind was what he did given the talent around him. Sure he had a good offensive line, so did Trent Richardson, Montee Ball, Wilson and Griffin. Nobody, however, put up the kind of numbers Luck did throwing to three tight ends who didn’t have separation speed and with his best wide receiver sitting on the sidelines the second half of the year. Griffin had the dynamic Kendall Wright, Luck had Griff Whalen. That was a factor in my mind. Two things: 1) So the Cardinals were 23-2 over the last two seasons because of Luck, yet had amazing offense balance on offense, “more balanced than any other in the country.” 2) Luck didn’t have great numbers, yet he makes it to New York because he could thrown to tight ends without separation speed? For many seeing this, the thought is that I gave Moore the third spot as a career achievement award. I did not. For most of the week leading up to voting I had a running back (Ball or Richardson) penciled in. But before I was making my choices I looked again at what the diminutive but excellent quarterback had done this year. Statistically he was great: 300-of-405 passing (74%), 3,507 yards, 41 touchdowns and seven picks. I watched a lot of Boise State games this year (even the blowouts) and know that most of the numbers were accomplished in three quarters or less. I dunno, Fisher, this sounds pretty close to an achievement award vote to me. Moore does have great statistics, yet they are skewed (lifetime, too) by the competition he’s faced. And as we’ll see later, you can’t ignore the competition level for one candidate and make it an issue for another. Ball was on my ballot for the stretch run but fell just short after considering Moore. He led the country in rushing with 1,759 yards and in scoring with 17.54 points per game. His 38 touchdowns is just one shy of Barry Sanders’ record and more than 45 entire teams. It hurt that Russell Wilson was the man Wisconsin picked to campaign for earlier in the year but Ball without a doubt had a season to remember and was an outstanding college football player in 2011. Ball indeed had a great season and he played for a conference champion in a good league. I think had he been given more consideration by the national media for a longer time, his garbage time numbers (or lack thereof) would have received more scrutiny. I would have probably voted him fourth, as well. I wanted to put Barkley in my top three because he has not only been outstanding on the field leading USC back to the top 10, but he has been the face of the program that was put through the ringer. He set a school and conference record for touchdown passes in a season and tossed six TDs in a game twice. It was a season for the ages but he was hampered by a very slow start to the year, the Arizona State game and the head-to-head loss to Luck. I guess my question is, why not put Barkley in your top three? My other comment would be this is Fisher’s third player out of six that plays on the west coast. Trent Richardson, running back, Alabama: He was the best offensive player in the SEC and a great player who I’d want on my team in a heartbeat but I didn’t think Richardson was the best running back in the country. He played only four games against schools with a winning record and faced just two defenses ranked in the top 40 against the rush. 46% of his yards came against North Texas, Ole Miss, Georgia Southern and Auburn and nearly the same percentage of his touchdowns came against those four defensive powerhouses. I get that he was hurt at times and shared carries; Richardson is a great player but just wasn’t the best this season. Some things are better left unsaid. Richardson may not have better stats than Ball (that’s a debate for another day), but the Heisman Foundation does not list statistics a requisite for winning. And to announce that you don’t think Richardson is the best running back in the country is laughable. Apparently, Fisher thinks it’s ok to fine-tooth-comb Richardson’s opponents, but gives a pass to others. Again, laughable. [H]e’s a game changer unlike any other in the way he forces turnovers and returns kicks. That said, he wasn’t the most outstanding player on his own team (punter Brad Wing was) and wasn’t even the best player in the secondary (Morris Claiborne was). His coverage skills were solid but not spectacular and had he not had two big games against Arkansas and Georgia to end the season, wouldn’t have been invited to New York. The suspension during the season also played a factor. If he’s not the best player on his team or the best at his position, why did Fisher even add him to this list? Brad Wing the best player on LSU’s team? C’mon, are you kidding me? Fisher can obviously vote any way he pleases as long as he has a a vote. And to be honest, any sort of reasons he gives for how he votes will always fall short in some people’s eyes. But to my eyes, Fisher’s ballot seems to sport a West Coast bias and he seems to make a laughable argument against Richardson. 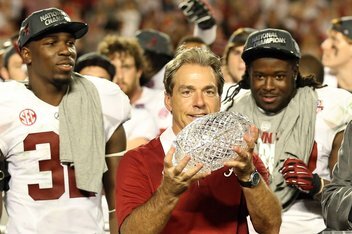 According to some folks, Trent Richardson lost the Heisman Trophy because he didn’t play Saturday. Baylor’s Robert Griffin III finished with a strong game versus Texas and appears to have the award sewn up. Many spent the last couple of weeks of the season comparing Alabama and Oklahoma State. Some folks even railed on the “horrible” defenses that Alabama played. Well, I decided to apply this same criteria to Richardson and Griffin. Richardson has run for 1,583 yards (6.02 per attempt) and has scored 20 rushing touchdowns (23 total). Griffin has passed for 3,998 yards, 36 touchdowns and six interceptions. This year, he also averaged 10.8 yards per attempt. So here are some numbers related to each defense Alabama and Baylor faced. The defensive rank is based on yards allowed per game. The statistics for FCS teams Georgia Southern and Stephen F. Austin are not included. One number is particular is very telling. Adding the defensive rank for each team provides a good indicator for the strength of defenses faced compared to other teams. For example, Alabama’s total of 444 is almost half the total of Baylor’s indicating that Baylor played against some horrific defenses. Alabama played some against some bad defenses, namely North Texas and Mississippi, but the median rank of their opponents’ defenses was 28. That’s not too bad. 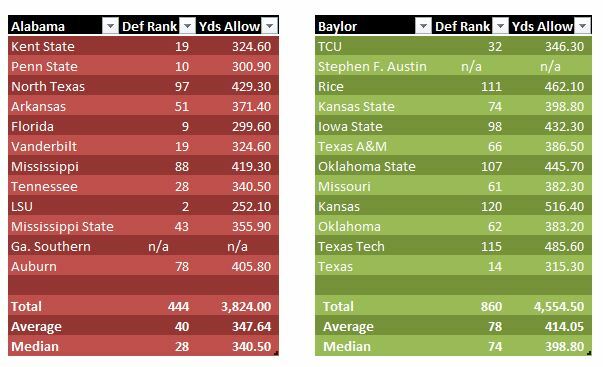 Baylor, though, based on their average and median calculations, played week-in and week-out horrible defenses. The Heisman Trophy is awarded to “the outstanding college football player whose performance best exhibits the pursuit of excellence with integrity.” It’s very hard to compare candidates based simply on statistics, and, in fact, the best statistics aren’t actually a requirement. It’s sort of like a popularity contest and voters cast their votes for a variety of reasons. Some have an agenda, some have regional biases, some may only pay attention to the candidates on the last weekend of the season and some actually vote for the player they think is the best. This year, I would assume there is some negative affect on Richardson based on how the BCS standings turned out. There has to be. There is, no doubt, some negative affect from Alabama not playing in the SEC Championship game. After all, Mark Ingram most likely solidified his win with a great game versus Florida in 2009. Richardson is also very close statistically to Montee Ball of Wisconsin. Think about the above comparison when pundits begin to talk about how great Griffin’s statistics are. Baylor plays in a conference with horrible defenses. Griffin shouldn’t be punished for that, after all, he’s a great player. But at the same time, it should be considered. In fact, if you look at passing statistics for very long, you begin to wonder why Houston’s Case Keenum wasn’t invited to the presentation ceremony.